A video shared by BBC Strictly’s official Twitter account. delighted Strictly Come Dancing fans with footage featuring last week’s dances accompanied by the sound from their microphones. One clip showed Charles Venn, 45, and Karen Clifton, 36, at the beginning of their Charleston, dressed as window cleaners in a cradle. Karen could be heard squealing as her celebrity partner swiped at her with his cloth. 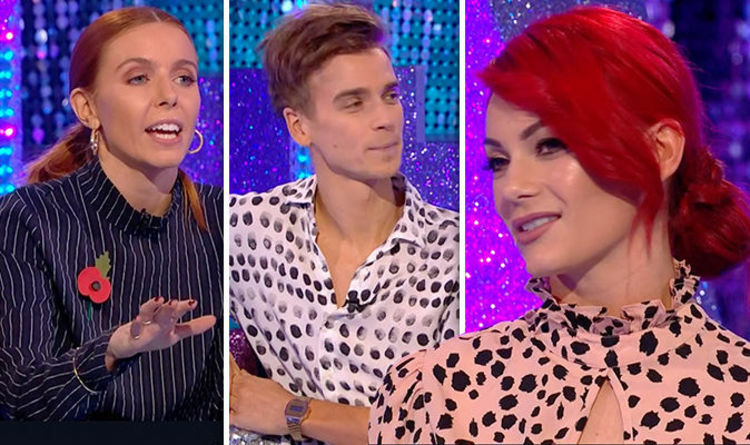 Joe Sugg, 27, and his professional partner Dianne Buswell, 29, could be seen in the middle of their energetic Samba routine. The mic picked up Dianne letting out a triumphant “Woo!” as they wiggled their hips. But it was Kate Sillverton, 48, and Aljaz Skorjanec, 28, who stole the show as the professional dancer emitted a series of endearing noises throughout their performance. An ever supportive Aljaz could also be heard yelling, “Go Kate!” as she launched into the routine. Tomorrow night, the Strictly contestants will take to the dance floor at Blackpool Tower Ballroom for the first time for the annual extravaganza in the North. With Danny John-Jules, 58, and his partner Amy Dowden, 27, being eliminated last weekend after going head-to-head with Graeme and Oti, the stars will be hoping to bring their A-game in order to make it through to the next week of the competition. Graeme and Oti are performing their Couples’ Choice Theatre and Jazz routine to The Trolley Song from Meet Me in St. Louis as they aim to dodge the bottom two. Having topped the leaderboard with an emotional Contemporary dance last weekend, Ashley Roberts, 37, and Pasha Kovalev, 38, are dancing the Jive to Shake Ya Tail Feather. Meanwhile, Faye Tozer, 43, and Giovanni Pernice, 28, will be hoping to continue their Strictly success with a passionate Paso Doble and Kate and Aljaz will be tackling the American Smooth as they aim to boost their position to get into the top half of the leaderboard. With Blackpool week acting as a milestone Strictly strs hope to hit every year, after tomorrow night’s show, talk will undoubtedly turn to who could go all the way and make it to the grand final. Strictly Come Dancing continues tomorrow at 6.45pm on BBC One.